The FA Cup is truly the best of all football competitions, and while too much may sometimes be made of the romance of the contest, there is undoubtedly something unique and special about the opportunity for part-time teams, for whom their club is a hobby rather than a collection of world-class footballing talent, to face up the world’s elite, and maybe even triumph. Non-league clubs have battled through way through qualification, some already having claimed the scalps of third or fourth-tier clubs – and now the Premier League enters the fray. Forget the hundreds of millions spent on sponsorship, TV fees and players, shareholder dramas and fractious press conferences – this is what it’s really all about. 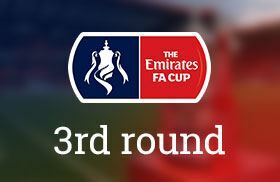 These three matches may well be the best of what the third round has to offer, but as always, expect the unexpected across the whole fixture list – that’s the magic of the cup. For the two titans of Merseyside to face off at the earliest opportunity is a gift of the draw. The Premier League table points to a straightforward Liverpool win, with Jürgen Klopp’s side having hit 50 league goals already this season since the addition of Mohamed Salah. Everton, meanwhile, have been stumbling from years of top-half consistency to a team that, in the first half of the season at least, has failed to gel, with key players looking like shadows of themselves, not to mention the absences through injury of Ross Barkley and Leighton Baines. However, form means little in the FA Cup, and Everton have taken the seemingly shrewd step of turning to Sam Allardyce to turn their season around. His back-to-basics approach is bearing fruit, and opposing teams are learning to guard against an Everton side who are looking solid again. Wayne Rooney has found his scoring boots and will relish the chance to return to Anfield wearing blue. While Liverpool historically have the better of Everton, their defensive frailties are well-documented. Whether or not Virgil Van Dijk’s £75m arrival will shore up this weak link, Everton’s strikers will look to seize any opportunity to slip through a backline which has looked unsteady this season. With captain Jordan Henderson injured and star man Salah a doubt, Liverpool’s FA Cup meeting with Everton has all the makings of a classic derby – and it’s anybody’s to win. Another big local match-up and Sunderland will be hoping for some respite from a poor league run, delivering them only 22 points with more than half the season gone and risking a fall to League One. Middlesbrough meanwhile are chasing the playoffs, yet with only three more games won than lost, Wearside manager Chris Coleman may look at them as ripe for a home defeat. Lewis Grabban will look to add to his 12 goals so far this season, while for Middlesbrough, Britt Assombalonga has the same number to his name. Darron Gibson will be missed by Sunderland through injury. One of the most heated fan rivalries in football since a war of words in the 1970s, Palace travel to the Amex fresh from an impressive draw with runaway leaders Manchester City, though lost Scott Dann and Jason Puncheon to injury in the process. Brighton meanwhile are looking strong in their first Premier League season, and with only one loss in their last five, their ability to frustrate sides may make the difference in a cup-tie, especially when passions are running high. Glenn Murray and Pascal Gross lead their scorers. 1xbet offer a wide selection of LIVE bets on the FA Cup with video stream whilst offering high odds and instant payout! Bet using the best ENGLISH FA CUP odds. Enjoy bigger wins with SBOBET Asian Handicap, 1X2 and Over Under betting.